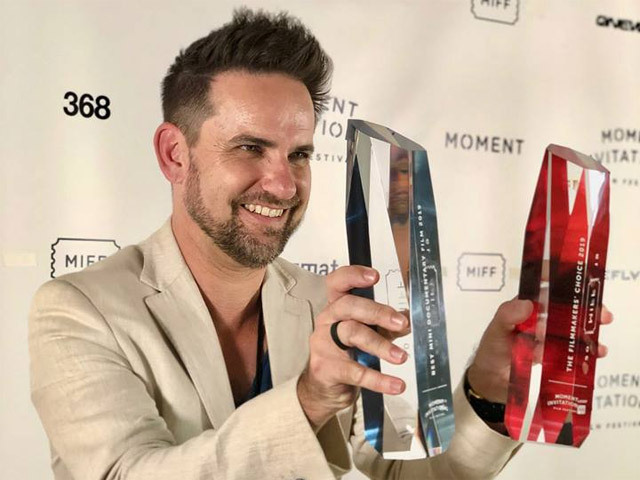 Central Coast Filmmaker, Jason Van Genderen was the only Australian finalist in the Moment Invitational Film Festival. This global smartphone film festival has attracted 987 entries from all over the world, largely due to the unbelievable $100,000 prize pool. Entrants had to make a short film (on a smartphone) that was 3 min or less and would fit within 1 of 5 nominated categories: Doco, Narrative, How To, Experimental, or Travel. Jason's film entitled "Beholder" is an emotive story about re-discovering his deceased father's sculptures hidden in his garage. 'Beholder" was named as one of 15 finalists with all 15 filmmakers invited to NYC on Saturday 13 April to find an over-all winner. Van Genderen's short film took out 'Best Mini Documentary'. While still basking in the glow of winning his category it was announced that he had also taking out Best Film in 'Filmmakers Choice'. This will see Van Genderen bring home $20,000. "I just couldn't believe it. Winning this festival means I can make a larger story about my dad's art, and we'll film that entirely on iPhone as well." said Van Genderen moments after his win on Saturday night. Standing on stage, the self-taught Aussie filmmaker dedicated the win to the memory of his father, bringing the New York audience to tears. One of the judges was renowned filmmaker and YouTube star Phillip Bloom - who phoned in his scores just an hour before the film premiered at the New York City event. "I'm just so proud I have been gifted this chance to reconnect my dad's life work with a global audience... he would never have dreamed this was possible when he was alive". Jason's first international festival win was also in New York, winning Tropfest NY in 2008 with a film captured on a Nokia N95. This self-taught filmmaker also runs a local agency called Treehouse Creative, which recently became Australia's first video production studio to switch entirely to iPhones as their broadcast capture cameras. Jason Van Genderen is changing the language of film making. Proving once again that films which speak to people are less to do with expensive equipment and more about your skill and the story you have to tell.